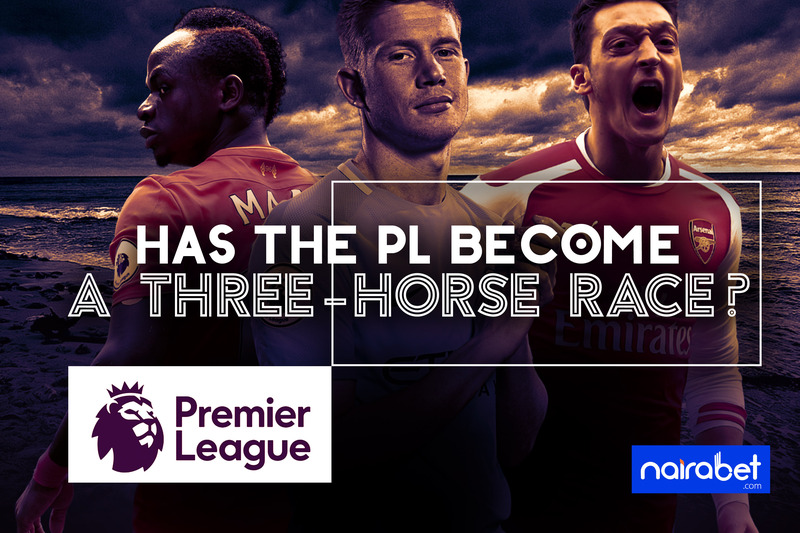 Has the PL Become a Three-Horse Race? After the weekend’s action in the Premier League, 12 of the 38 games of the season have now been played. Gradually, the distance between the south and the north of the PL table is increasing with each MatchDay. Another Arsenal draw, another Newcastle win, another Fulham defeat and another Manchester City win. One-third of the season is long gone now. And the battle for who will win the league is stiffer than ever before. A quick glance at the summit of the table gives a glimpse of how competitive this season is. Manchester City’s derby win sent them back to the top of the table after Liverpool’s win put them momentarily at the top. As it stands, Manchester City now top the table with 32 points. In second there’s Liverpool with 30 points. Chelsea’s draw against Everton sees them in third with 28 points. Tottenham (27 points) and Arsenal (24 points) are not far behind. But what has caught the eye of most fans are the top three teams. A quick reminder: they remain unbeaten in the league. That is 12 games without defeat. No doubt, these three teams are favorites to win the league. With the way they’ve played this season, they seem to have formed a top three caucus of the top four. It remains to be seen, which team will get the better of Manchester City. Their master-class win over a hapless United side only made them look even more invincible. That they’ve defeated Arsenal and Tottenham, and could have defeated Liverpool, all away from home is a testament to how good they’ve been. Pep Guardiola’s men will be looking to pile on more pressure on former City manger, Manuel Pellegrini. How many goals do you think they will score? Liverpool’s front three don’t look as sharp as they were last season. But they’re still very sharp. And they’re the reason (alongside their expensive goalie of course) Liverpool’s up there in second place. They’re ironically the fourth best scoring side in the league. But their defence is the joint best so far this season. Up next for the Reds is a trip to Watford. How do you think this game will end? Will there be over 2,5 goals? SarriBall has taken over at the Stamford Bridge. Chelsea’s 27-goal tally is only second to City’s 36. Maurizio Sarri’s draw against Everton was a new record for the Blues. The Italian became the first Chelsea manager to not lose in his first 12 league games in charge. Eden Hazard and co. remain the only unbeaten side in Europe’s top five leagues this season. A London derby awaits Chelsea after the international break. They will face Tottenham away from home. Scoring an average of two goals per game, how many goals do you think Tottenham will concede? The question is: has the title race become a three-horse race? What do you think? Leave us your comments and share your thoughts with us.